Draft: 2012, Pittsburgh Pirates, 5th rd. Adrian David Sampson… graduated from Skyline (WA) High School in 2010… attended Bellevue Community College, 2010-11…named the Most Valuable Pitcher in 2012 after going 11-0 with a 1.36 ERA (12 ER, 79.1 IP) with 107 SO in 13 G…was named the No. 1 Junior College prospect in the country by Perfect Game and was the starting pitcher in the West Coast Collegiate League All-Star game in 2011…brother, Julian, pitched for 4 seasons in the Phillies minor league system from 2007-10…selected by the Miami Marlins in the 16th round of the 2011 June Draft, but did not sign… selected in 5th round of 2012 June Draft by Pittsburgh. Returned from a lengthy disabled list stint and went 2-2 with a 3.45 ERA (12 ER/31.1 IP) over 8 starts with the AZL Rangers, Down East, and Round Rock…opened season on the disabled list and completed rehab assignment with the AZL Rangers, 7/27-8/16…allowed one unearned run over 2.0 IP on 7/27 vs. AZL A's in 1st official game action since 6/23/16 at DET…activated from the disabled list on 8/17 and assigned to Down East…started a pair of games for the Wood Ducks and was promoted to Round Rock on 8/26…permitted one R-ER over 10.0 IP in a pair of starts for the Express. Made major league debut with the Mariners, but was injured warming up prior to his next outing and missed the remainder of the season...allowed 4 R over 4.2 innings in his lone outing on 6/18 at BOS…did not throw a pitch in his final scheduled outing on 6/23 at DET, leaving that contest after warming up due to injury…had surgery to repair a flexor tendon in his right elbow on 6/30…spent the balance of the season with Triple-A Tacoma, going 7-4 with a 3.25 ERA (29 ER/80.1 IP) over 13 games/ starts…received by Texas on waivers from Seattle on 11/2 and was outrighted to the minors on 11/18. 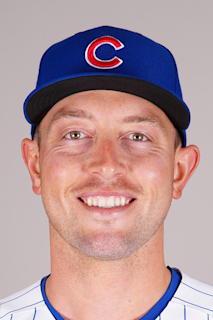 Combined to go 10-12 with a 4.76 ERA (86 ER/162.2 IP) in 28 starts between Triple-A Indianapolis and Triple-A Tacoma…struck out a careerhigh 123 batters…began season with Indianapolis, going 6-3 with a 2.69 ERA (22 ER/73.2 IP) in first 12 starts of the season, 4/10- 6/7...acquired by the Mariners from the Pirates, in exchange for LHP J.A. Happ on 7/31…assigned to Tacoma, going 2-4 with a 7.28 ERA (31 ER/38.1 IP) in 7 starts, 8/2-9/4. Went 11-6 with two complete games, one shutout, a 2.96 ERA (55 ER/167.0 IP) and 109 strikeouts in 28 combined starts between Double-A Altoona and Triple-A Indianapolis...finished T3rd among Pittsburgh minor leaguers in wins and 4th in ERA and strikeouts... was named to the Eastern League mid and post-season All-Star teams as well as being named Altoona's Pitcher-of-the-Year... ranked 2nd in the Eastern League in ERA, while also ranking 4th in innings pitched and batting average against (.229) among starting pitchers...ranked 3rd among Eastern League starters in fewest baserunners per 9.0 innings (9.79) and walks per 9.0 innings (1.76)...came within 2 outs of becoming the first individual to throw a 9.0 inning no-hitter in Altoona history on July 18 vs. Bowie...went 0-0 with one save and a 2.25 ERA (3 ER/ 12.0 IP) in 10 relief appearances while playing for Scottsdale in the Arizona Fall League...named to AFL Rising Stars team. Spent season with Bradenton…recorded 9 quality starts, with all 9 coming over his final 15 starts of the season, 6/3-8/8. Began professional career with St. College in the NYP League, appearing in 11 games/9 starts. April 1, 2019 Texas Rangers selected the contract of RHP Adrian Sampson from Nashville Sounds. January 4, 2019 Texas Rangers signed free agent RHP Adrian Sampson to a minor league contract and invited him to spring training. January 4, 2019 RHP Adrian Sampson assigned to Nashville Sounds. November 30, 2018 RHP Adrian Sampson elected free agency. September 4, 2018 Texas Rangers selected the contract of RHP Adrian Sampson from Round Rock Express. January 29, 2018 Texas Rangers invited non-roster RHP Adrian Sampson to spring training. August 26, 2017 RHP Adrian Sampson assigned to Round Rock Express from Down East Wood Ducks. August 17, 2017 RHP Adrian Sampson assigned to Down East Wood Ducks. July 27, 2017 RHP Adrian Sampson assigned to AZL Rangers from Round Rock Express. July 27, 2017 sent RHP Adrian Sampson on a rehab assignment to AZL Rangers. April 6, 2017 Round Rock Express placed RHP Adrian Sampson on the 60-day disabled list. November 18, 2016 Texas Rangers sent RHP Adrian Sampson outright to Round Rock Express. November 7, 2016 Texas Rangers activated RHP Adrian Sampson from the 60-day disabled list. November 2, 2016 Texas Rangers claimed RHP Adrian Sampson off waivers from Seattle Mariners. July 5, 2016 Seattle Mariners transferred RHP Adrian Sampson from the 15-day disabled list to the 60-day disabled list. Right elbow discomfort. June 24, 2016 Seattle Mariners placed RHP Adrian Sampson on the 15-day disabled list. Right flexor bundle strain. June 18, 2016 Seattle Mariners selected the contract of RHP Adrian Sampson from Tacoma Rainiers. February 15, 2016 Seattle Mariners invited non-roster RHP Adrian Sampson to spring training. July 31, 2015 RHP Adrian Sampson assigned to Tacoma Rainiers. January 9, 2015 Pittsburgh Pirates invited non-roster RHP Adrian Sampson to spring training. August 14, 2014 RHP Adrian Sampson assigned to Indianapolis Indians from Altoona Curve. March 29, 2014 RHP Adrian Sampson assigned to Altoona Curve from Bradenton Marauders. April 2, 2013 RHP Adrian Sampson assigned to Bradenton Marauders from GCL Pirates. September 1, 2012 Adrian Sampson assigned to GCL Pirates from State College Spikes. June 29, 2012 Adrian Sampson assigned to State College Spikes. June 19, 2012 Pittsburgh Pirates signed RHP Adrian Sampson.